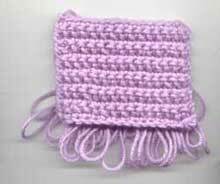 To crochet scarf is easy, but even making just a simple rectangular you can be very creative. Look at this stylish scarf with pom poms. We will go step by step making this scarf. For our example we need to crochet a rectangular 12 x 50 inches. (Don't relay upon my calculations! Do your own!). To check a scarf pattern which you see in the table below , I made a swatch 15 stitches = 4.0 in, 6 rows = 3.5 in. To begin a scarf you will need : 3.75 st/in x 12 in = 45 stitches. 1.71 rows/in x 50 in = 85.5 rows. Round it to 86 rows. Now a couple more "technological things" , to make your project possible. 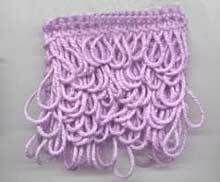 This scarf pattern is based on a single crochet stitch - the simplest possible stitch. The fabric has a "right" and "wrong" side. The main thing about this pattern is to remember how to insert a hook. (Check these Crochet Instructions if necessary.) A pattern has only two rows to repeat. Follow the description. Step 1. Insert a hook under the two loops and pool a loop. Step 2. 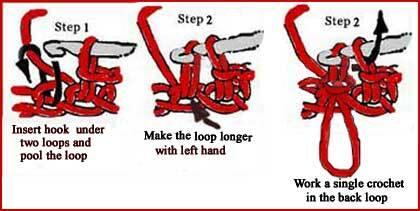 Release the hook from this new loop, with your left hand, pool the loop and make it about 0.75 - 1 inch long. Let it stay on the "right" side of your fabric. Step 3. Work a single crochet in the back loop of the same stitch. Work a single crochet under the two loops of each stitch of the previous row. One of the numerous ways to make it. Step 1. Make two circles of the cardboard. Diameter of each circle is equal to the diameter of the pompon. Cut a hole in the center of each circle. Its diameter depends on the yarn thickness. Step 2. Take a needle with strand of yarn and wrap the doughnuts together till you can't see a hole in the center of it. Step 3. Cut the yarn along the circumference of the doughnuts. Pull the cardboard slightly apart. Tightly tie a length of yarn in between the doughnuts. Cut off the cardboard. Step 4. Trim pom pom, to make it look neat.